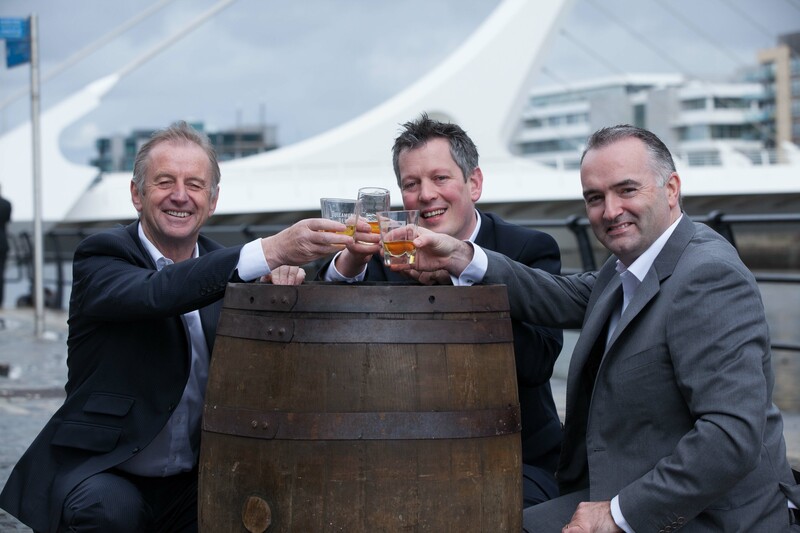 Ireland’s inaugural Whiskey Week, a celebration of one of Ireland’s most celebrated and successful products, was launched today by representatives of three of the country’s leading distilleries – Irish Distillers, Grants and Cooley Distillery. Running from the 21st – 26th May and launched in conjunction with Whiskey Live Dublin, Whiskey Week will feature bespoke events celebrating uisce beatha at the country’s leading distilleries as well as whiskey pubs and hotels around the country. Activity will include whiskey showcase events, tastings, food pairings, promotions and much more. Gavin O’Doherty (Irish Distillers), John Cashman (Cooley Distillery) and John Quinn (William Grants) raise a glass at today’s announcement of Ireland’s inaugural Whiskey Week. The week commences with a unique tasting session of the Jameson range in the Old Jameson Distillery led by master distiller Liam Donegan. Patrons will be given the opportunity to sample the original Jameson range through to the Rarest Vintage Reserve. Other events throughout the week include specially commissioned tours of the Kilbeggan Distillery, the world’s oldest licensed whiskey distillery, which will run daily throughout the week to provide an insight into the people and processes behind the 250 year old brand. Events included in Whisky Week are strictly over 18’s. Further information about the events including Tickets is available from www.whiskylive.com. Tasting of the Jameson range from Original through to Rarest Vintage Reserve led by distiller Liam Donegan. There will be time for a general whiskey conversation after the tasting. Location:The Old Jameson Distillery, Bow Street, Smithfield, Dublin 7. Join Patsy Doyle and his team for some chat, sampling and general good craic. An outdoor event with Paul Quinn, Irelands cigar and whiskey aficionado, guides you through a tutor whisky and cigar matching. Rob Allanson and Michael Foggarty go head to head again this year but have the added twist of matching different foods also. Do you know your Irish from your Scottish black pudding? Two whiskey dinners, one venue. Join the global brand ambassadors for great food and great whiskey. Places limited to 20 people per dinner. Ireland’s premier whiskey tasting show, Whisky Live Dublin, will make a return to The Round Room at The Mansion House in the heart of Dublin’s city centre on Saturday 26th May 2012.We have expert advice on hand and the opportunity to learn about the whisky basics as well as delve deeper into the hearts and minds of those who create the products every day; with great entertainment, appetising food and an amazing range of tastings, Whisky Live will be the whiskey event of 2012. Location:The Mansion House, Dawson Street, Dublin 2.